Feng shui tips and principles offer an excellent framework to guide you in creating a serene home. You can use these guidelines to make some of those difficult interior design choices of color, furniture, accessories and furniture placement for your home easier. 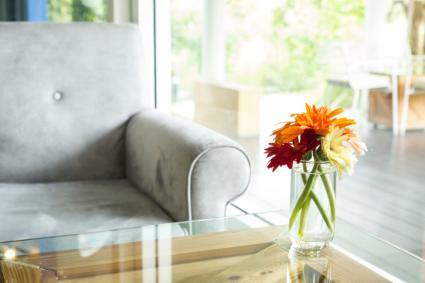 Keeping a clutter free home may be old news, but it's vital to maintaining a serene environment. Clutter creates stagnant chi energy and prevents life vitality from nurturing your home. Establish a few simple house rules that will ensure your initial feng shui efforts are ongoing. Return items to proper place after use. Leave rooms in better shape than when entered. Place dirty clothes in laundry bin. Remove shoes when entering home and place in closet or appropriate storage area. Hats, coats, purses, backpacks and keys placed in designated storage space. Select the color and element for each room based on compass direction. Each compass direction has several assigned colors and one element. You can incorporate these into any room design. The one exception is the use of the water element in bedrooms. Never place water in a bedroom. Since colors don't activate elements, but are merely symbolic, you can feel free to use blue and black in the North sector. The chart below shows the colors most conducive to a serene bedroom. Some directions have more colors in their palettes that have been omitted in the chart. These aren't included since they are more energetic, such as the south direction color red. The master bedroom should be a retreat. Start by using the bedroom colors assigned to each compass direction. To boost the chi energy, add some of the appropriate elements for the compass direction. For example, an east or southeast bedroom will benefit by adding wood elements, such as a wood headboard and other furniture and objects. When using elements, don't overpower the room by adding too much of the element. The key to a successful feng shui design for this and other rooms is to create a balanced design. Use marriage symbols in paintings, fabrics, objects or figurines, such as a pair of mandarin ducks, pomegranates, peonies, peach blossoms, and rose quartz. Never place a water feature or paintings of water in a bedroom. Water provides too much yang energy and is very disruptive to a peaceful bedroom. Mirrors should be avoided in bedrooms, except when using to counter a bed placement where a line of sight with the door is needed. A mirror that reflects a bed invites a third party into the marriage, creating infidelity. Bed placement is important. Avoid placing the bed directly across from the door and underneath or in front of windows. Don't use plants in the bedroom since this is too much yang energy for a restful sleep. This is a yang room and not always a serene setting since it's filled with fire (yang) and activity (yang). 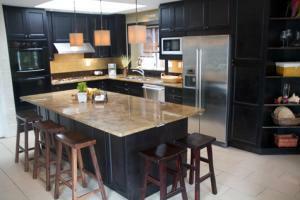 The way you can incorporate the kitchen into an overall serene home is through organization and layout. If you're in the planning stages of building a new home, then you can use the kua number for the breadwinner to locate the kitchen in a suitable direction. Place appliances according to feng shui rules of elements, such as fire versus water as well as hot versus cold. Never leave dirty dishes in sink or on counter. Either place in dishwasher or wash. Potted herbs in the east, southeast, and south will attract prosperity and lend a tranquil touch to this area. The living room is the gathering place for the family to spend time together relaxing. There are a few things you can do to achieve this goal. Furniture placement plays a major role in the success of a feng shui layout for this room. Never place furniture in natural pathways between doors. Place sofa against a solid wall. Allow enough space between furniture for chi energy to move through the room. This room is vital to the wealth and abundance of the family. There are few things you can easily add to this room to make it flow with the rest of your house design to ensure a sense of comfort and calmness. 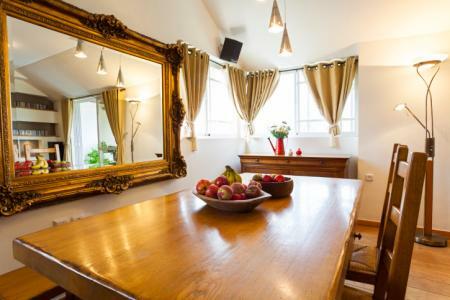 Place a wall mirror so it reflects the table (and food) to double your fortune and provide a feeling of satisfaction and abundance. Don't dine near the front door this sets up an uneasy feeling and will cause your fortune will slowly slip away, creating stress. Dining room and kitchen should be on the same level, never with the dining room below the kitchen level. Create a lush garden or vignette outside the dining room window to offer a tranquil view. If located in the southeast or north, place a water feature in the garden. Just make sure the water flows toward the house. The feeling of not having enough space to dine creates a feeling of restlessness. If your home doesn't have a separate space for eating, then designate one in your home, either in the kitchen or living room. This can be done with a space-saving drop leaf table that you open up for meals. There are a lot of things you can do to lessen the negative energy of bathrooms that can disrupt the serene energy you want to achieve. In feng shui, the energy found in a bathroom is considered inauspicious since this is a room that carries waste and dirty water from the house. A few easy to do tips can help improve the chi energy of your home and keep the inauspicious chi confined while contributing to a calming design. Keep toilet lid closed when not in use and when flushing. Fix leaky faucets and toilets that run all the time. Hang a door mirror on the inside to reflect energy back into the bathroom. Hang a door mirror on the outside of the bathroom door to make the room (and inauspicious chi) disappearance. Keep bathroom and all fixture clean at all times. The home office is an important room for a feng shui home design. You can create a restive work environment with a few feng shui additions. When designing this space, it's helpful to think of it the same way you would a business office. Place desk in command position that's located directly across from main door. This will instill a sense of well-being and confidence when you work. Sit facing your best kua position (sheng chi) to take advantage of good energy and a feeling of success. Never sit with a window at your back. This won't support you and create an uneasy and disturbing feeling. Always sit with a solid wall behind you to provide support and give you a comforting feeling. Hang a photo or painting of mountain behind you. Be sure peaks aren't jagged. This adds to your overall feeling of support. Place plants and lights at door entrance into office. These two elements lend a feeling of relaxation. Place a water feature on the north wall of your office with water flowing into the room. The sound of trickling water will help create a calm environment. Create a small private garden space in your outside space just for meditation and relaxation. Keep outside entrance clutter free. Maintain and manicure yard and shrubbery. Spruce up paint when needed. Replace burned out lightbulbs in outdoor lighting fixture. There are many objects that you can add to various rooms in your home to help imbue peace and harmony while ensuring abundance to your family. These are also used as feng shui cures or remedies for afflicted areas. If an area is afflicted, it will disrupt any feeling of comfort, peace and serenity. A small desktop water fountain or aquarium should be placed in north or southeast sector of home (unless it's the bedroom). This sound will help to sooth away the stresses of the day. Fu dogs will guard your home against burglars and loss and imbue a feeling of protection and safety. 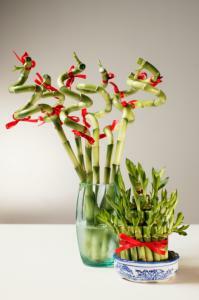 Lucky bamboo helps to re-energize your home, but also instills the restive aspect of nature inside your home. Place in east or southeast of home or home office. The crane is an ancient symbol of harmony. Use a pair in the bedroom or den to establish the calming energy this symbol brings. Feng shui principles are based on the philosophy of balanced yin and yang energies. When you create a balance interior design using these guidelines, a rhythm of harmony is set in motion that in turn creates a serene feeling within your home.